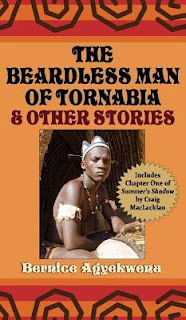 "In the grand storytelling tradition of One Thousand and One Nights comes 'The Beardless Man of Tornabia & Other Stories' by Bernice Agyekwena. The Beardless Man of Tornabia & Other Stories is a collection of original African fairy tales rooted in the traditional beliefs, folklore, myths and cultural practices of the peoples of Africa. It shares the same characteristics with traditional fairy-tales from all over the world, with common themes such as an ordinary girl getting married to a royal, and deprived children finding a benefactor, as well as tales examining the eternal battle between right and wrong, good and evil. So, re-discover Africa with this vivid and exciting collection of unique African fairy tales, deeply rooted in African myths and traditions, with Bernice Agyekwena in her stunning debut work." This book was quite different from the fairy tales I'm used to reading but at the same time proved that some themes are universal. It gave a good insight into African traditions and way of life, whilst at the same time communicating lessons that apply to people around the world. There was a particular emphasis on greed and selfishness in many of the stories. Witchcraft was also a common element. I recommend this book for alternative fairy tales but also for readers with an interest in African in general. Thanks for dropping by. I was drawn to it because it was something "out of the ordinary".